ATTENTION ALL SPRING LAKE LAKER FANS! Mark Wednesday, August 29 on your calendar! There will be a HUGE pep rally in the parking lot right in front of the high school from 5:30 to 7:30 p.m. The rally is being put on by the Spring Lake High School Interact Club and Athletic department. Mark Wednesday, August 29 on your calendar! There will be a HUGE pep rally in the parking lot right in front of the high school from 5:30 to 7:30 p.m. The rally is being put on by the Spring Lake High School Interact Club and Athletic department. All donations will go to the Helen DeVos Children's Hospital. 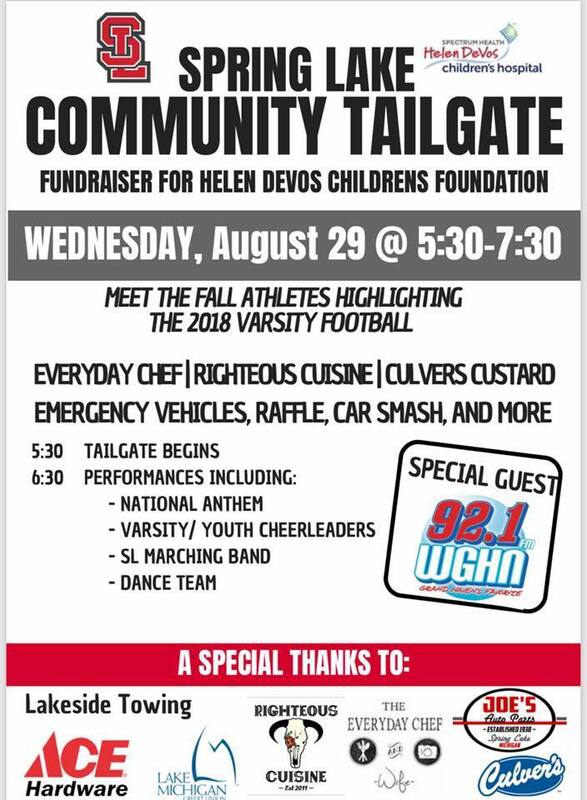 We are also partnered with Gridiron Giving which is a partnership program where high schools in the OK Conferences and Wendy's of Michigan raised funds for Helen DeVos. A. All fall sports teams and coaches. B. WGHN Radio with speakers and many interviews. H. Police, firefighters and an ambulance for tours. I. Aero Med's Helicopter will land at the SLHS parking lot at 7pm! Don't miss this very exciting event to start the school year!